Texting while driving is illegal in Florida, but that doesn’t stop drivers of all ages from picking up a phone when it buzzes. 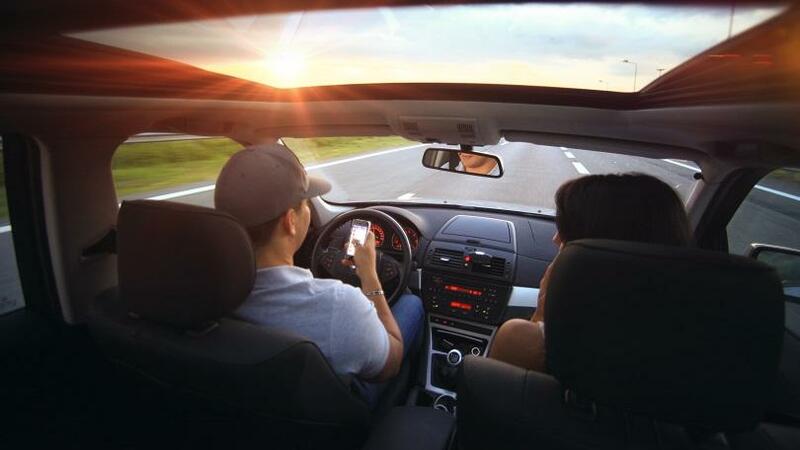 While many Americans feel compelled to instantly respond to their digital devices, a mere five second glance away at 40-50 mph will result in hundreds of feet of travel. In that seemingly small amount of time, anything can happen. Despite a statewide texting ban, the habit remains a real problem on Florida roadways. Texting is a negligent act that can cause serious car accidents. Williams Law, P.A. represents texting-related accident victims in legal claims throughout the St. Petersburg area. Florida’s texting law does not universally ban texting. Instead, it categorizes texting as a secondary offense. In other words, an officer cannot pull you over for texting alone. The act must accompany a suspected primary offense such as speeding or reckless driving. Under current laws, drivers can continue to talk using handheld devices or use a device for navigation and safety without consequence. Car accidents rarely involve a singular cause. Instead, they occur because a driver engaged in multiple reckless activities at once. 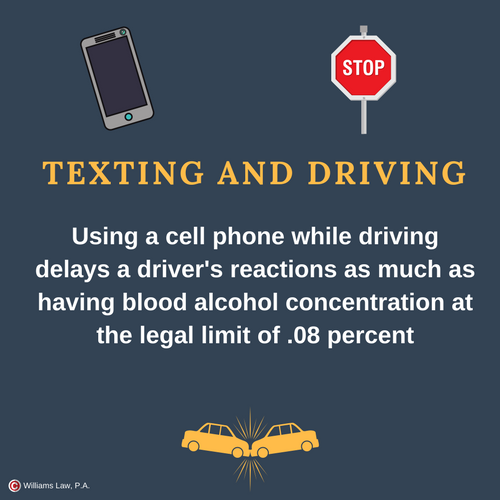 Texting increases the risks associated with every other negligent driving behavior including speeding, failure to stop or yield, and driving while intoxicated. When careless texting contributes to serious accidents, victims can take steps to secure compensation and punish negligent drivers. After an accident, most drivers in Florida must turn to their own insurance benefits to receive compensation. If the accident resulted in a mild to moderate injury, a claim against your own insurer may provide the best and only path to recovery. Auto insurers are responsible for administering full benefits according to the terms of a policy. Unfortunately, insurance companies do not always put their clients’ best interests first. Instead, they may try to deflect liability and offer accident victims subpar settlements. At Williams Law, P.A., we specialize in insurance claims. Our founding attorney, K.C. Williams, has handled countless auto insurance claims over the years. We have the resources and the legal knowledge to hold even the largest insurers accountable for full policy benefits. After a preventable texting-related accident, you deserve compensation for all your losses. We can negotiate with insurers on your behalf to ensure you receive fair benefits. If a texting-related accident causes a catastrophic injury or death, victims and their families can move outside of the no-fault insurance system to obtain justice and fair compensation. A formal injury claim goes beyond insurance coverage to hold negligent drivers fully accountable for their accident-causing behaviors. If your texting-accident claim goes to court, the jury will evaluate fault using a pure comparative fault rule. Jury members will evaluate the actions of both parties to assign a percentage of fault and award damages to those injured. Proving a defendant was texting while driving can increase his or her percentage of fault and increase the total damages awarded to the plaintiff. At Williams Law, P.A., we begin each accident claim with a thorough investigation. We will use all of our resources to prove the negligence of the defendant and secure a full recovery on your behalf. In personal injury claims, victims may recover more compensation than insurance policy benefits would provide. Our team can help you determine if your accident goes beyond our state’s no-fault laws. You deserve the best possible outcome after suffering in a reckless texting-related car accident. Many accident victims feel lost after a major accident. They wonder how they will manage their medical expenses, lost wages, and the pain they will endure for months or years. Often, legal action is the only way to obtain a fair and full recovery. Whether you pursue a claim against your own insurance provider or seek justice from a negligent driver, Williams Law, P.A. can help. Reach out to our office in St. Petersburg today for a free consultation. We’ll handle the details of your case so you can focus on achieving a maximum physical recovery.